The new and improved Skip Tunes. 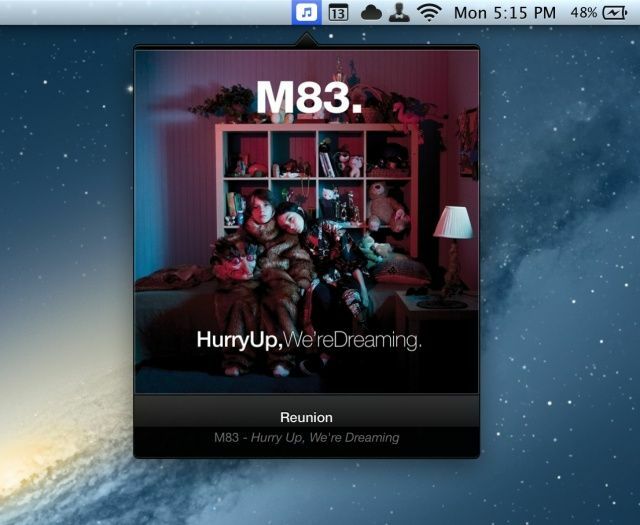 Earlier this year I praised Skip Tunes as a simple, gorgeously designed Mac menu bar app for controlling music. The best thing about Skip Tunes is that it can control not only iTunes playback, but Spotify and Rdio as well. Verizon 2.0 of the app has arrived in the Mac App Store, and the update packs some nice features. Since Skip Tunes lives in the Mac’s menu bar, keyboard shortcuts are essential for using the app. Today’s new version includes keyboard shortcuts for playing/pausing a track and skipping back and forth between tracks in a playlist. The app’s interface has been optimized for the new MacBook Pro’s Retina display, and album artwork is displayed when you click on the Skip Tunes icon. Audio scrubbing has been included in this new version to let you quickly move throughout a track from the menu bar, and shuffle support has also been added. You can set your default music player in the app’s settings, and that’s about all there is to Skip Tunes. The app keeps things simple while adding a nice layer of functionality for anyone who listens to music regularly on the Mac. I still wish there was a keyboard shortcut for switching between music sources (iTunes, Spotify, Rdio), or perhaps the app could automatically recognize the audio source. Once that kind of feature is added, Skip Tunes will be practically perfect. But for now, the app is still a nice, minimal tool. You can download Skip Tunes for $2 in the Mac App Store.